Rep. Don Young (R-Ark.) has taken over the helm of the House Transportation & Infrastructure Committee, after chairing the Resources Committee for the past six years. In one of his first acts as Chairman, on January 31, 2001, Chairman Young announced the new subcommittee Chairmen for the Transportation & Infrastructure (T&I) Committee for the 107th Congress. Chairman Young also set an ambitious agenda for the T&I Committee. The following were named as new subcommittee Chairmen: Rep. Tom Petri (R-Wisc.) - Highways and Transit Subcommittee; Rep. John Duncan (RTenn.) - Water Resources and Environment Subcommittee; Rep. John Mica - Aviation Subcommittee; Rep. Jack Quinn (R-N.Y.) - Railroads Subcommittee; Rep. Steven LaTourette (ROhio)- Economic Development, Public Buildings and Emergency Management Subcommittee; and Rep. Frank LoBiondo (R-N.J.) - Coast Guard and Maritime Transportation Subcommittee. Ranking Members of the Subcommittees are, respectively, Reps. Robert Borski (D-Penn.) for Highways; Peter A. DeFazio (D-Ore.) for Water Resources; William O. Lipinski (D- 111.) for Aviation; Bob Clement (DTenn.) for Railroads; Jerry Costello (D- 111.) for Economic Development; and Corrine Brown (D-Fla.) for Coast Guard and Maritime Transportation. Whether the reauthorization of TEA- 21 — not scheduled until 2003 — will include further funds form maritime programs such as former Secretary of Transportation Rodney Slater's ambitious Marine Transportation System of the Americas remains to be seen. The responsibilities of the Subcommittee on Aviation, the Subcommittee on Coast Guard and Maritime Transportation, and the Subcommittee on Water Resources and Environment will not be changed. The leadership of the Senate Commerce Committee remains more constant, with Sen. John McCain (R-Ariz.) continuing as Chairman this Congress and Sen. Ernest (Fritz) Hollings (DS. C.) as the Ranking Member. Maritime jurisdiction in Commerce is divided between Senator Olympia Snowe's (R-Maine) Subcommittee on Oceans and Fisheries, (which includes Coast Guard jurisdiction), and Sen.
Gordon Smith's (R-Ore.) Surface Transportation and Merchant Marine Subcommittee. USCG To Explore Deeper Waters The Coast Guard is urging Congress to find an estimated $9 billion for its new Deepwater Capability Replacement Project. 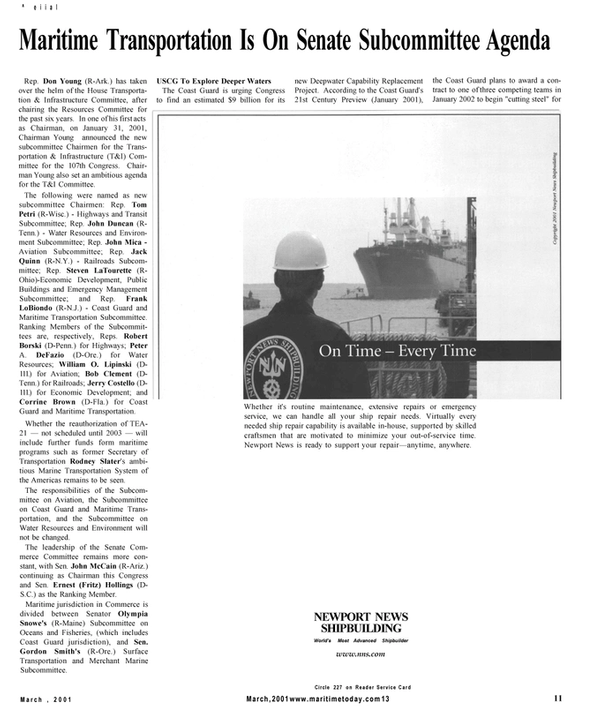 According to the Coast Guard's 21st Century Preview (January 2001), the Coast Guard plans to award a contract to one of three competing teams in January 2002 to begin "cutting steel" for the delivery of the new deepwater assets to replace its aging cutters, aircraft, and communications systems. For FY 2002, the Coast Guard is looking for $350- $500 million to initiate the Deepwater Project. The T&I Committee has jurisdiction to authorize such a Project, but only the Appropriations Committees can provide actual dollars. Where to find this money at a time of tight budgets remains an open question. Also facing the Coast Guard Subcommittee will be what to do with ballast water exchange programs. A few years ago, Congress passed federal legislation requiring all ships entering the Great Lakes to exchange ballast water and then amended the legislation to establish a nation-wide program modeled after the Great Lakes region. States have also adopted legislation setting their own ballast water standards. This issue has become very controversial and Congress may decide to take further action.